This article is about the U.S. city. For the county in California, see Los Angeles County. For other uses, see Los Angeles (disambiguation). "L.A." and "City of Los Angeles" redirect here. For other uses, see L.A. (disambiguation) and City of Los Angeles (disambiguation). Nickname(s): "L.A.", "City of Angels", "Angeltown", "The Entertainment Capital of the World", "The Big Orange" "La-la-land", "Tinseltown"
Los Angeles ( i/lɒs ˈændʒəlᵻs/ loss AN-jə-ləs or loss AN-jə-liss) (Spanish for "The Angels"), officially the City of Los Angeles and often known by its initials L.A., is the second-largest city in the United States after New York City, the most populous city in the U.S. state of California, and the county seat of Los Angeles County. Situated in Southern California, Los Angeles is known for its mediterranean climate, ethnic diversity, sprawling metropolis, and as a major center of the American entertainment industry. Los Angeles lies in a large coastal basin surrounded on three sides by mountains reaching up to and over 10,000 feet (3,000 m). The city is the focal point of the larger Los Angeles metropolitan area and the Greater Los Angeles Area region, which contains 13 million and over 18 million people, respectively, as of 2010, making it one of the most populous metropolitan areas in the world as well as the second-largest in the United States. Los Angeles is the seat of Los Angeles County, the most populated county in the United States. The city's inhabitants are referred to as Angelenos. Nicknamed the City of Angels, Los Angeles is a global city with a diverse economy in entertainment, culture, media, fashion, science, sports, technology, education, medicine and research. It has been ranked sixth in the Global Cities Index and 9th Global Economic Power Index. The city is home to renowned institutions covering a broad range of professional and cultural fields and is one of the most substantial economic engines within the United States. The Los Angeles combined statistical area (CSA) has a gross metropolitan product (GMP) of $831 billion (as of 2008), making it the third-largest in the world, after the Greater Tokyo and New York metropolitan areas. Los Angeles includes Hollywood and leads the world in the creation of television productions, video games, and recorded music; it is also one of the leaders in motion picture production. Los Angeles hosted the Summer Olympic Games in 1932 and 1984, and is currently bidding for the 2024 Summer Olympics. Chumash people lived in Los Angeles before Europeans settled there. The Los Angeles coastal area was first settled by the Tongva (Gabrieleños) and Chumash Native American tribes thousands of years ago. A Gabrielino settlement in the area was called iyáangẚ (written Yang-na by the Spanish), meaning "poison oak place". Juan Rodríguez Cabrillo, a Portuguese-born explorer, claimed the area of southern California for the Spanish Empire of the Kingdom of Spain in 1542, while on an official military exploring expedition moving north along the Pacific coast from earlier colonizing bases of New Spain in Central and South America. Gaspar de Portolà and Franciscan missionary Juan Crespí, reached the present site of Los Angeles on August 2, 1769. In 1771, Franciscan friar Junípero Serra directed the building of the Mission San Gabriel Arcángel, the first mission in the area. On September 4, 1781, a group of forty-four settlers known as "Los Pobladores" founded the pueblo called "El Pueblo de Nuestra Señora la Reina de los Ángeles del Río de Porciúncula"; in English it is "The Town of Our Lady the Queen of the Angels of the Porciúncula River". The Queen of the Angels is an honorific of the Virgin Mary. Two-thirds of the settlers were mestizo or mulatto with a mixture of African, indigenous and European ancestry. The settlement remained a small ranch town for decades, but by 1820, the population had increased to about 650 residents. Today, the pueblo is commemorated in the historic district of Los Angeles Pueblo Plaza and Olvera Street, the oldest part of Los Angeles. B. The Old Aliso, giant sycamore, historical symbol of Los Angeles. L. Bella Union hotel, site of southern Legislature (Diputación). M. Stage road, extension of Spring Street's former oblique, to points west such as "Cahuenga Valley." N. El Camino Real, "the Royal Highway," east from San Gabriel on Aliso St. & north to San Fernando on old Main St.
Railroads arrived with the completion of the Southern Pacific line to Los Angeles in 1876. Oil was discovered in the city and surrounding area in 1892, and by 1923, the discoveries had helped California become the country's largest oil producer, accounting for about one-quarter of the world's petroleum output. By 1900, the population had grown to more than 102,000, putting pressure on the city's water supply. The completion of the Los Angeles Aqueduct in 1913, under the supervision of William Mulholland, assured the continued growth of the city. In 1910, Hollywood merged into Los Angeles, with 10 movie companies already operating in the city at the time. By 1921, more than 80 percent of the world's film industry was concentrated in L.A. The money generated by the industry kept the city insulated from much of the economic loss suffered by the rest of the country during the Great Depression. By 1930, the population surpassed one million. In 1932, the city hosted the Summer Olympics. During World War II, Los Angeles was a major center of wartime manufacturing, such as shipbuilding and aircraft. Calship built hundreds of Liberty Ships and Victory Ships on Terminal Island, and the Los Angeles area was the headquarters of six of the country's major aircraft manufacturers (Douglas Aircraft Company, Hughes Aircraft, Lockheed, North American Aviation, Northrop Corporation, and Vultee). During the war, more aircraft were produced in one year than in all the pre-war years since the Wright brothers invented the airplane in 1903, combined. Manufacturing in Los Angeles skyrocketed, and as William S. Knudsen, of the National Defense Advisory Commission put it, "We won because we smothered the enemy in an avalanche of production, the like of which he had never seen, nor dreamed possible. The Richfield Tower, an Art Deco landmark of 1929, was demolished in 1969. The 1960s saw race relations boil-over into the Watts Riots of 1965 which resulted in 34 deaths and over 1,000 injuries. It was the most severe riot in the city's history until the Los Angeles riots of 1992. In 1969, Los Angeles became one of the birthplaces of the Internet, as the first ARPANET transmission was sent from the University of California, Los Angeles (UCLA) to SRI in Menlo Park. In 1984, the city hosted the Summer Olympic Games for the second time. Despite being boycotted by 14 Communist countries, the 1984 Olympics became more financially successful than any previous, and the second Olympics to turn a profit until then – the other, according to an analysis of contemporary newspaper reports, being the 1932 Summer Olympics, also held in Los Angeles. Racial tensions erupted on April 29, 1992, with the acquittal by a Simi Valley jury of the police officers captured on videotape beating Rodney King, culminating in large-scale riots. They were the largest riots in US history causing approximately $1.3 billion in damage as well as 53 deaths and over 2,000 injuries. Hollywood is a neighborhood in Los Angeles. The city is divided into over 80 districts and neighborhoods, many of which were incorporated places or communities that merged into the city. These neighborhoods were developed piecemeal, and are well-defined enough that the city has signage marking nearly all of them. More broadly, the city is divided into the following areas: Downtown Los Angeles, East Los Angeles and Northeast Los Angeles, South Los Angeles, the Harbor Area, Greater Hollywood, Wilshire, the Westside, and the San Fernando and Crescenta Valleys. The city's street pattern generally follows a grid plan, with uniform block lengths and occasional roads that cut across blocks. However, this is complicated by rugged terrain, which has necessitated having different grids for each of the valleys that Los Angeles covers. Major streets are designed to move large volumes of traffic through many parts of city; many of them are extremely long: Sepulveda Boulevard is 43 miles (69 km) long, while Foothill Boulevard is over 60 miles (97 km) long, reaching as far east as San Bernardino. Drivers in Los Angeles suffer from one of the worst rush hour periods in the world, according to an annual traffic index by navigation system maker, TomTom. L.A. drivers spend an additional 92 hours in traffic each year. During the peak rush hour there is 80% congestion, according to the index. Los Angeles is strongly characterized by the presence of low-rise buildings. Outside of a few centers such as Downtown, Warner Center, Century City, Koreatown, Miracle Mile, Hollywood and Westwood, skyscrapers and high-rise buildings are not the rule. The few skyscrapers that are built outside of those areas often stand out above the rest of the surrounding landscape. Most construction is done in separate units, rather than wall-to-wall. That being said, downtown Los Angeles itself has many buildings over 30 stories, with fourteen over 50 stories, and two over 70 stories (the tallest buildings west of Chicago-see List of tallest buildings in Los Angeles). Also, Los Angeles is increasingly becoming a city of apartments rather than single family dwellings, especially in the dense inner city and Westside neighborhoods. Important landmarks in Los Angeles include the Hollywood Sign, Walt Disney Concert Hall, Capitol Records Building, the Cathedral of Our Lady of the Angels, Angels Flight , TCL Chinese Theatre, Dolby Theatre, Griffith Observatory, Getty Center, Getty Villa, the Los Angeles Memorial Coliseum, the Los Angeles County Museum of Art, the Venice Canal Historic District and boardwalk, Theme Building, Bradbury Building, U.S. Bank Tower, Wilshire Grand Tower, Hollywood Boulevard, Los Angeles City Hall, Hollywood Bowl, Battleship USS Iowa, Watts Towers, Staples Center, Dodger Stadium, and Olvera Street. The city of Los Angeles is irregularly shaped and covers a total area of 502.7 square miles (1,302 km2), comprising 468.7 square miles (1,214 km2) of land and 34.0 square miles (88 km2) of water. The city extends for 44 miles (71 km) longitudinally and for 29 miles (47 km) latitudinally. The perimeter of the city is 342 miles (550 km). Los Angeles is both flat and hilly. The highest point in the city proper is 5,074 ft (1,547 m) Mount Lukens, located at the northeastern end of the San Fernando Valley. The eastern end of the Santa Monica Mountains stretches from Downtown to the Pacific Ocean and separates the Los Angeles Basin from the San Fernando Valley. Other hilly parts of Los Angeles include the Mt. Washington area north of Downtown, eastern parts such as Boyle Heights, the Crenshaw district around the Baldwin Hills, and the San Pedro district. Los Angeles is rich in native plant species partly because of its diversity of habitats, including beaches, wetlands, and mountains. The most prevalent plant communities are coastal sage scrub, chaparral shrubland, and riparian woodland. Native plants include: California poppy, matilija poppy, toyon, Ceanothus, Chamise, Coast Live Oak, sycamore, willow and Giant Wildrye. Many of these native species, such as the Los Angeles sunflower, have become so rare as to be considered endangered. Though it is not native to the area, the official tree of Los Angeles is the Coral Tree (Erythrina caffra) and the official flower of Los Angeles is the Bird of Paradise (Strelitzia reginae). Mexican Fan Palms, Canary Island Palms, Queen Palms, Date Palms, and California Fan Palms are common in the Los Angeles area, although only the last is native. Los Angeles is subject to earthquakes because of its location on the Pacific Ring of Fire. The geologic instability has produced numerous faults, which cause approximately 10,000 earthquakes annually in Southern California, though most of them are too small to be felt. One of the major faults is the San Andreas Fault. Located at the boundary between the Pacific Plate and the North American Plate, it is vulnerable to the "big one", a potentially large earthquake striking California through the San Andreas fault. Major earthquakes that have hit the Los Angeles area include the 1994 Northridge earthquake, the 1987 Whittier Narrows earthquake, the 1971 San Fernando earthquake near Sylmar, and the 1933 Long Beach earthquake. Nevertheless, all but a few quakes are of low intensity and are not felt; the two most recent ones to hit the area, on the Newport–Inglewood Fault, on Sunday morning, May 3, 2015, of 3.9-magnitude with no recorded injuries or damage, and on Sunday, April 12, 2015, of 3.5-magnitude, again with no recorded injuries or damage, were of this type. The Los Angeles basin and metropolitan area are also at risk from blind thrust earthquakes. USGS has released UCERF California earthquake forecast which models Earthquake occurrence in California. Parts of the city are also vulnerable to tsunamis; harbor areas were damaged by waves from the Valdivia earthquake in 1960. Los Angeles has a Subtropical-Mediterranean climate (Köppen climate classification Csb on the coast, Csa inland), and receives just enough annual precipitation to avoid either Köppen's BSh or BSk (semi-arid climate) classification. Los Angeles has plenty of sunshine throughout the year, with an average of only 35 days with measurable precipitation annually. The coastal region around Los Angeles has a climate that is comparable to coastal areas of Rabat, Morocco, in temperature range and variation, as well as annual precipitation levels and rainfall distribution. Temperatures in the coastal basin exceed 90 °F (32 °C) on a dozen or so days in the year, from one day a month in April, May, June and November to three days a month in July, August, October and to five days in September. Temperatures in the San Fernando and San Gabriel Valleys are considerably warmer. Temperatures are subject to substantial daily swings; in inland areas the difference between the average daily low and the average daily high is over 30 Fahrenheit (16 Celsius) degrees. The average annual temperature of the sea is 63 °F (17 °C), from 58 °F (14 °C) in January to 68 °F (20 °C) in August. Hours of sunshine total more than 3,000 per year, from an average of 7 hours of sunshine per day in December to an average of 12 in July. The Los Angeles area is also subject to phenomena typical of a microclimate, causing extreme variations in temperature in close physical proximity to each other. For instance, the average July maximum temperature at the Santa Monica Pier is 75 °F (24 °C) whereas it is 95 °F (35 °C) in Canoga Park. The city, like much of the southern California coast, is subject to a late spring/early summer weather phenomenon called "June Gloom". This involves overcast or foggy skies in the morning which yield to sun by early afternoon. Downtown Los Angeles averages 14.93 in (379 mm) of precipitation annually, which mainly occurs during late autumn and winter (November through March), generally in the form of moderate rain showers, but sometimes as heavy rainfall during winter storms. Summer days are usually rainless. Rarely, an incursion of moist air from the south or east can bring brief thunderstorms in late summer, especially to the mountains. The coast gets slightly less rainfall, while the inland and mountain areas get considerably more. Years of average rainfall are rare. The usual pattern is year to year variability, with a short string of dry years of 5–10 in (130–250 mm) rainfall, followed by one or two wet years with more than 20 in (510 mm). Wet years are usually associated with warm water El Nino conditions in the Pacific, dry years with cooler water La Nina episodes. A series of rainy days can bring floods to the lowlands and mudslides to the hills, especially after wild fires have denuded the slopes. Both freezing temperatures and snowfall are extremely rare in the city basin and along the coast, with the last occurrence of a 32 °F (0 °C) reading at the downtown station being January 29, 1979; freezing temperatures occur nearly every year in valley locations while the mountains within city limits typically receive snowfall every winter. The greatest snowfall recorded in downtown Los Angeles was 2.0 inches (5 cm) on January 15, 1932. At the official downtown station, the highest recorded temperature is 113 °F (45 °C) on September 27, 2010, while the lowest is 28 °F (−2 °C), as recently as January 4, 1949. During autumn and winter, Santa Ana winds sometimes bring very hot and dry conditions to Los Angeles, and raise the wild fire risk. The smog season lasts from May to October. While other large cities rely on rain to clear smog, Los Angeles gets only 15 inches (380 mm) of rain each year: pollution accumulates over many consecutive days. Issues of air quality in Los Angeles and other major cities led to the passage of early national environmental legislation, including the Clean Air Act. More recently, the state of California has led the nation in working to limit pollution by mandating low-emission vehicles. Smog is expected to continue to drop in the coming years because of aggressive steps to reduce it, which include electric and hybrid cars, improvements in mass transit, and other measures. The number of Stage 1 smog alerts in Los Angeles has declined from over 100 per year in the 1970s to almost zero in the new millennium. Despite improvement, the 2006 and 2007 annual reports of the American Lung Association ranked the city as the most polluted in the country with short-term particle pollution and year-round particle pollution. In 2008, the city was ranked the second most polluted and again had the highest year-round particulate pollution. The city met its goal of providing 20 percent of the city's power from renewable sources in 2010. The American Lung Association's 2013 survey ranks the metro area as having the nation's worst smog, and fourth in both short term and year round pollution amounts. Climate change has already affected Los Angeles with a 4 degree average temperature rise from 1878 to 2005 with a UCLA study predicting that coastal areas will rise 3 to 4 degrees in temperature and urban areas 4 to 4.5 degrees. In 2014, the fire season never finished in Southern California and studies have predicted that climate change will cause more frequent and larger fires by the end of the century. Climate change is also expected to affect sea levels which are expected to rise 5 to 24 inches from 2000 to 2050 leading to higher storm surge and waves, which could result in more extensive flooding that could threaten critical coastal infrastructure. 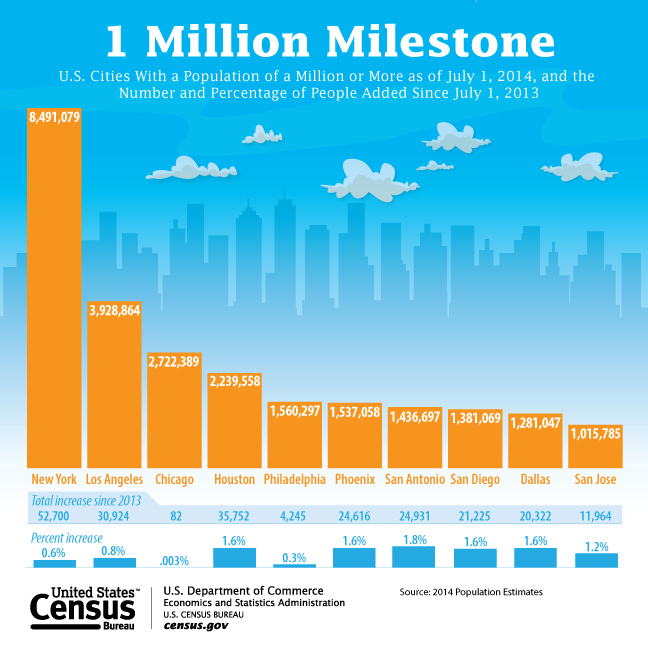 The 2010 United States Census reported that Los Angeles had a population of 3,792,621. The population density was 8,092.3 people per square mile (2,913.0/km²). The age distribution was 874,525 people (23.1%) under 18, 434,478 people (11.5%) from 18 to 24, 1,209,367 people (31.9%) from 25 to 44, 877,555 people (23.1%) from 45 to 64, and 396,696 people (10.5%) who were 65 or older. The median age was 34.1 years. For every 100 females there were 99.2 males. For every 100 females age 18 and over, there were 97.6 males. Los Angeles is home to people from more than 140 countries speaking 224 different identified languages. Ethnic enclaves like Chinatown, Historic Filipinotown, Koreatown, Little Armenia, Little Ethiopia, Tehrangeles, Little Tokyo, Little Bangladesh and Thai Town provide examples of the polyglot character of Los Angeles. According to the 2010 Census, the racial makeup of Los Angeles included: 1,888,158 Whites (49.8%), 365,118 African Americans (9.6%), 28,215 Native Americans (0.7%), 426,959 Asians (11.3%), 5,577 Pacific Islanders (0.1%), 902,959 from other races (23.8%), and 175,635 (4.6%) from two or more races. Hispanics or Latinos of any race were 1,838,822 persons (48.5%). Non-Hispanic whites were 28.7% of the population in 2010, compared to 86.3% in 1940. People of Mexican ancestry make up the largest ethnic group of Latinos at 31.9% of Los Angeles' population, followed by those of Salvadoran (6.0%) and Guatemalan (3.6%) heritage. The Latino population is spread throughout the city of Los Angeles and its metropolitan area but it is most heavily concentrated in the East Los Angeles region, which has a long established Mexican-American and Central American community. The largest Asian ethnic groups are Filipinos (3.2%) and Koreans (2.9%), which have their own established ethnic enclaves−Koreatown in the Wilshire Center and Historic Filipinotown. Chinese people, which make up 1.8% of Los Angeles' population, reside mostly outside of Los Angeles city limits and rather in the San Gabriel Valley of eastern Los Angeles County, but make a sizable presence in the city, notably in Chinatown. Chinatown and Thaitown are also home to many Thais and Cambodians, which make up 0.3% and 0.1% of Los Angeles' population, respectively. Japanese comprise 0.9% of L.A.'s population, and have an established Little Tokyo in the city's downtown, and another significant community of Japanese Americans is located in the Sawtelle district of West Los Angeles. Vietnamese make up 0.5% of Los Angeles' population. Indians make up 0.9% of the city's population. The city of Los Angeles and its metropolitan area are home to a large Middle Eastern population, including Armenians and Iranians, partially residing in enclaves like Little Armenia and Tehrangeles. African Americans have the largest establishment in South Los Angeles, including the industrial neighborhoods of Crenshaw and Watts. In 1970, the Census Bureau reported the city's population as 17.9% black, 61.1% non-Hispanic white and 17.1% Hispanic. However, since the 1980s, there has been a large influx of immigration from Mexico and Central America which have outnumbered the blacks in South Los Angeles. South Los Angeles, as well as neighboring communities such as the city of Compton that were home to predominant African American populations are now transforming into Hispanic communities. Built in 1956, the Los Angeles California Temple of The Church of Jesus Christ of Latter-day Saints is the second largest LDS temple in the world. According to a 2014 study by the Pew Research Center Christianity is the most prevalently practiced religion in Los Angeles (65%). The Roman Catholic Archbishop of Los Angeles leads the largest archdiocese in the country. Cardinal Roger Mahony oversaw construction of the Cathedral of Our Lady of the Angels, which opened in September 2002 in downtown Los Angeles. Construction of the cathedral marked a coming of age of the city's Catholic, heavily Latino community. There are numerous Catholic churches and parishes throughout Los Angeles. In 2011 the once common but ultimately lapsed custom of conducting a procession and Mass in honour of Nuestra Señora de los Ángeles in commemoration of the founding of the City of Los Angeles in 1781 was revived by the Queen of Angels Foundation and its founder Mark Albert, with the support and approbation of the Archdiocese of Los Angeles as well as several civic leaders. The recently revived custom is a continuation of the original processions and Masses which commenced on the first anniversary of the founding of Los Angeles in 1782 and continued for nearly a century thereafter. With 621,000 Jews in the metropolitan area (490,000 in city proper), the region has the second largest population of Jews in the United States. Many of Los Angeles' Jews now live on the Westside and in the San Fernando Valley, though Boyle Heights and Northwest Los Angeles once had large Jewish populations. Many varieties of Judaism are represented in the area, including Reform, Conservative, Orthodox, and Reconstructionist. The Breed Street Shul in East Los Angeles, built in 1923, was the largest synagogue west of Chicago in its early decades. (It is no longer a sacred space and is being converted to a museum and community center.) The Kabbalah Centre also has a presence in the city. The International Church of the Foursquare Gospel was founded in Los Angeles by Aimee Semple McPherson in 1927 and remains headquartered there to this day. For many years, the church convened at Angelus Temple, which, when built, was one of the largest churches in the country. The Los Angeles California Temple, the second largest temple operated by The Church of Jesus Christ of Latter-day Saints, is on Santa Monica Boulevard in the Westwood district of Los Angeles. Dedicated in 1956, it was the first LDS temple built in California and it was the largest in the world when completed. Because of Los Angeles' large multi-ethnic population, a wide variety of faiths are practiced, including Islam, Buddhism, Hinduism, Zoroastrianism, Sikhism, Bahá'í, various Eastern Orthodox Churches, Sufism and others. Immigrants from Asia for example, have formed a number of significant Buddhist congregations making the city home to the greatest variety of Buddhists in the world. Atheism and other secular beliefs are also common, as the city is the largest in the Western U.S. Unchurched Belt. Financial companies such as US Bancorp, Ernst & Young, Aon, Bank of America, and Deloitte have offices in the Downtown Financial District. The economy of Los Angeles is driven by international trade, entertainment (television, motion pictures, video games, music recording, and production), aerospace, technology, petroleum, fashion, apparel, and tourism. Other significant industries include finance, telecommunications, law, healthcare, and transportation. Three of the six major film studios—Paramount Pictures, 20th Century Fox, and Universal Pictures—are located within the city limits. The Los Angeles–Long Beach metropolitan area has a gross metropolitan product of $866 billion (as of 2015), making it the third-largest economic metropolitan area in the world, after Tokyo and New York. Los Angeles has been classified an "Alpha world city" according to a 2012 study by a group at Loughborough University. The largest employers in the city as of 2009 were, in descending order, the City of Los Angeles, the County of Los Angeles, and University of California, Los Angeles. The University of Southern California (USC) is the city's fourth largest employer and the largest private sector employer. The city was home to six companies in the 2014 Fortune 500. Los Angeles is often billed as the "Creative Capital of the World", because one in every six of its residents works in a creative industry and that there are more artists, writers, filmmakers, actors, dancers and musicians living and working in Los Angeles than any other city at any time in history. The city's Hollywood neighborhood has become recognized as the center of the motion picture industry. Los Angeles plays host to the annual Academy Awards and is the site of the USC School of Cinematic Arts, the oldest film school in the United States. The performing arts play a major role in Los Angeles' cultural identity. According to the USC Stevens Institute for Innovation, "there are more than 1,100 annual theatrical productions and 21 openings every week." The Los Angeles Music Center is "one of the three largest performing arts centers in the nation", with more than 1.3 million visitors per year. The Walt Disney Concert Hall, centerpiece of the Music Center, is home to the prestigious Los Angeles Philharmonic. Notable organizations such as Center Theatre Group, the Los Angeles Master Chorale, and the Los Angeles Opera are also resident companies of the Music Center. Talent is locally cultivated at premier institutions such as the Colburn School and the USC Thornton School of Music. There are 841 museums and art galleries in Los Angeles County. In fact, Los Angeles has more museums per capita than any other city in the world. Some of the notable museums are the Los Angeles County Museum of Art (the largest art museum in the Western United States), the Getty Center (part of the larger J. Paul Getty Trust, the world's wealthiest art institution), the Battleship Iowa, and the Museum of Contemporary Art. A significant number of art galleries are located on Gallery Row, and tens of thousands attend the monthly Downtown Art Walk there. Dodger Stadium is the home of the Los Angeles Dodgers. Other notable sports teams include the UCLA Bruins and the USC Trojans in the NCAA, both of which are Division I teams in the Pac-12 Conference. Los Angeles is the second-largest city in the United States but had no NFL team between 1995 and 2015. At one time Los Angeles area had two NFL teams, the Rams and the Raiders. Both left the city in 1995, with the Rams moving to St. Louis, and the Raiders heading back to their original home of Oakland. After 21 seasons in St. Louis, on January 12, 2016, the NFL announced that the Rams would be coming back to Los Angeles for the 2016 season. A new stadium will be built in Inglewood, California for the team by the 2019 season.Prior to 1995, the Rams called Memorial Coliseum home (1946–1979) and the Raiders played their home games at Memorial Coliseum from 1982 to 1994. Staples Center is a sports arena, home to the Los Angeles Lakers, Los Angeles Clippers, and Los Angeles Kings. Los Angeles has twice played host to the Summer Olympic Games, in 1932 and in 1984, both times having the Memorial Coliseum as the host stadium. When the tenth Olympic Games were hosted in 1932, the former 10th Street was renamed Olympic Blvd. Super Bowls I and VII were also held in the city as well as multiple FIFA World Cup games at the Rose Bowl in 1994 including the final. Los Angeles also hosted the Special Olympics World Summer Games in 2015. Los Angeles boasts a number of sports venues, including Dodger Stadium, the Los Angeles Memorial Coliseum, The Forum, the StubHub Center, the Staples Center, and the Rose Bowl in nearby Pasadena. Staples Center also serves as the home arena for the Los Angeles Lakers and Los Angeles Clippers of the NBA, the Los Angeles Sparks of the WNBA, and the Los Angeles Kings of the NHL. It was also home to the Los Angeles Avengers of the original AFL, a team that did not participate in that league's ongoing revival. Los Angeles is a charter city as opposed to a general law city. The current charter was adopted on June 8, 1999 and has been amended many times since then. The elected government consists of the Los Angeles City Council and the Mayor of Los Angeles which operate under a mayor-council government, as well as the city attorney (not to be confused with the district attorney, a county office) and controller. The current mayor is Eric Garcetti. There are 15 city council districts. In the California State Assembly, Los Angeles is split between fourteen districts. In the California State Senate, the city is split between eight districts. In the United States House of Representatives, it is split between ten congressional districts. Los Angeles experienced a significant decline in crime in the 1990s and late 2000s and reached a 50-year low in 2009 with 314 homicides. This is a rate of 7.85 per 100,000 population—a major decrease from 1980 when a homicide rate of 34.2 per 100,000 was reported. This included 15 officer-involved shootings. One shooting led to the death of a SWAT team member, Randal Simmons, the first in LAPD's history. Los Angeles in the year of 2013 totaled 251 murders, a decrease of 16 percent from the previous year. Police speculate that the drop resulted from a number of factors, including young people spending more time online. The murder rate increased slightly from 6.5 per 100,000 people in 2013 to 6.7 per 100,000 in 2014. The murder rate increased for a second year in 2015. There has been an increase by 12% with over a month left in the year, erasing the decreases seen in the early 2010s. The Dragna crime family and the Cohen crime family dominated organized crime in the city during the Prohibition era and reached its peak during the 1940s and 1950s as part of the American Mafia but has gradually declined since then with the rise of various black and Hispanic gangs. According to the Los Angeles Police Department, the city is home to 45,000 gang members, organized into 450 gangs. Among them are the Crips and Bloods, which are both African American street gangs that originated in South Los Angeles. Latino street gangs such as the Sureños, a Mexican American street gang, and Mara Salvatrucha, which has mainly members of Salvadoran descent, all originated in Los Angeles. This has led to the city being referred to as the "Gang Capital of America". Private colleges in the city include the American Film Institute Conservatory, Alliant International University, Syracuse University (Los Angeles Campus), American Academy of Dramatic Arts (Los Angeles Campus), American Jewish University, The American Musical and Dramatic Academy – Los Angeles campus, Antioch University's Los Angeles campus, Charles R. Drew University of Medicine and Science, Emperor's College, Fashion Institute of Design & Merchandising's Los Angeles campus (FIDM), Los Angeles Film School, Loyola Marymount University (LMU is also the parent university of Loyola Law School located in Los Angeles), Marymount College, Mount St. Mary's College, National University of California, Occidental College ("Oxy"), Otis College of Art and Design (Otis), Southern California Institute of Architecture (SCI-Arc), Southwestern Law School, and University of Southern California (USC). The major daily English-language newspaper in the area is the Los Angeles Times. La Opinión is the city's major daily Spanish-language paper. The Korea Times is the city's major daily Korean language paper while The World Journal is the city and county's major Chinese newspaper. The Los Angeles Sentinel is the city's major African-American weekly paper, boasting the largest Black readership in the Western United States. Investor's Business Daily is distributed from its L.A. corporate offices, which are headquartered in Playa Del Rey. There are also a number of smaller regional newspapers, alternative weeklies and magazines, including the Los Angeles Register, Los Angeles Daily News (which focuses coverage on the San Fernando Valley), LA Weekly, L.A. Record (which focuses coverage on the music scene in the Greater Los Angeles Area), Los Angeles Magazine, the Los Angeles Business Journal, the Los Angeles Daily Journal (legal industry paper), The Hollywood Reporter, Variety (both entertainment industry papers), and Los Angeles Downtown News. In addition to the major papers, numerous local periodicals serve immigrant communities in their native languages, including Armenian, English, Korean, Persian, Russian, Chinese, Japanese, Hebrew, and Arabic. Many cities adjacent to Los Angeles also have their own daily newspapers whose coverage and availability overlaps into certain Los Angeles neighborhoods. Examples include The Daily Breeze (serving the South Bay), and The Long Beach Press-Telegram. The Los Angeles metro area is served by a wide variety of local television stations, and is the second-largest designated market area in the U.S. with 5,431,140 homes (4.956% of the U.S.). The city's subway system is the ninth busiest in the United States and its light rail system is the country's second busiest. The rail system includes the Red and Purple subway lines, as well as the Gold, Blue, Expo, and Green light rail lines. In 2016 the Expo Line will reach the Pacific at Santa Monica. The Metro Orange and Silver lines are bus rapid transit lines with stops and frequency similar to those of light rail. The city is also central to the commuter rail system Metrolink, which links Los Angeles to all neighboring counties as well as many suburbs. The main international and domestic airport serving Los Angeles is Los Angeles International Airport (IATA: LAX, ICAO: KLAX), commonly referred to by its airport code, LAX. The sixth busiest commercial airport in the world and the third busiest in the United States, LAX handled over 66 million passengers and close to 2 million tons of cargo in 2013. (IATA: ONT, ICAO: KONT) LA/Ontario International Airport, owned by the city of Los Angeles; serves the Inland Empire. One of the world's busiest general-aviation airports is also located in Los Angeles, Van Nuys Airport (IATA: VNY, ICAO: KVNY). The sea ports of the Port of Los Angeles and Port of Long Beach together make up the Los Angeles/Long Beach Harbor. Together, both ports are the fifth busiest container port in the world, with a trade volume of over 14.2 million TEU's in 2008. Singly, the Port of Los Angeles is the busiest container port in the United States and the largest cruise ship center on the West Coast of the United States – The Port of Los Angeles' World Cruise Center served about 590,000 passengers in 2014. ↑ Also i/lɒs ˈændʒəliːz/, or /lɒs ˈæŋɡəlᵻs/. The pronunciations /lɒs ˈændʒəlᵻs/ and /lɒs ˈæŋɡəlᵻs/ are most common inside the US, while/lɒs ˈændʒəliːz/ is most common outside the US. The name is from Spanish: Los Ángeles [los ˈaŋxeles], meaning The Angels. ↑ Parker, Dana T. Building Victory: Aircraft Manufacturing in the Los Angeles Area in World War II, pp.5-8, 14, 26, 36, 50, 60, 78, 94, 108, 122, Cypress, CA, 2013. ISBN 978-0-9897906-0-4. ↑ Hispanic origin based on the White population of Spanish mother tongue. This page was last modified on 9 November 2018, at 04:33.